Some of the finest walks in Brittany are to be found in the Trégor, an historic region that today comprises north-eastern Finistere and north-western Côtes d’Armor. This was essentially the district of the bishop of Tréguier, one of the oldest Breton cathedrals. 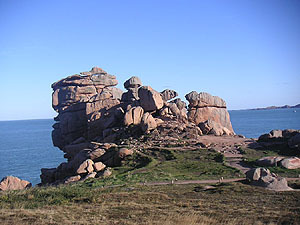 The sea shore here is well-known for the spectacular Pink Granite coast walk from Perros-Guirec to Ploumanac’h, an undemanding 3km that presents extraordinary rock formations of incredible size and peculiar shape. 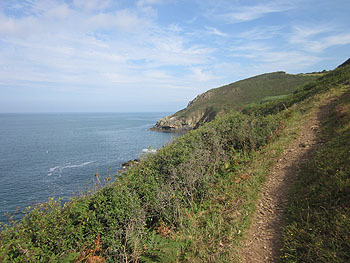 For a much-less frequented and moredemanding hike, BWs recommends the cliffs of Trédrez, where the GR34 runs along the sloping sides of a series of coastal hills covered by gorse and heather. One short section contains a warning for those with vertigo as the narrow pathruns right by the edge of a long drop, but past that, the path snakes along not too far above the water. There are sweeping views across the bay of St-Michel-en-Grève to Grand Rocher and Locquirec. A walk from St-Michel to Locquemeau will take about 2.5 hours, or try a well-marked circuit from Trédrez itself down to the coastal path. Another rewarding circuit of about 2 hours with seascapes, views of the Chateau du Taureau in the bay and a visit of exceptional interest is at Barnenez (just off the D76 from Morlaix), where you can follow a loop around the peninsula before exploring the Neolithic cairn on the hill-top (paying visit to site with exhibitions, shop, etc. ), possibly the oldest structure of any size in Europe. The interior of the Trégor is every bit as beautiful as the coast, characterised by deep river valleys and densely wooded terrain. The 11km circuit starting from the Château de Tonquedec (S of Lannion) is BWs favourite walk, taking in the river Léguer, chapels and another château on a very verdant route. An interesting itinerary (10km) starting from Pleumeur-Bodou and the famous Menhir de St-Uzec with its elaborate later Christian carvings takes in chapels and another tiny menhir before passing the famous telecommunications site where the earliest satellite broadcast between Europe and America took place in 1962. 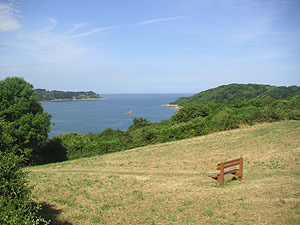 Le Yaudet is a little known site of great natural beauty, overlooking the estuary of the Léguer as it comes out into the sea. A 1.5 hour history trail is set up on the site, including Roman walls, the extraordinary church of Notre-Dame de Yaudet, where the Virgin Mary lies in a double bed above the altar, an 18th century guard-house and custom officers’ lookout, but for a longer route, starting from the commune centre at Ploulec’h, there’s a 14.5km circuit going across country to wooded banks of the river, along to Le Yaudet and then back via another peaceful valley.